The bill would let the city levy an annual property tax on non-primary residences that cost more than $5 million. While the measure was first floated by state Senator Hoylman in 2014, the question of what the city can do to reap value from empty high-rise penthouses was revived when hedge fund billionaire Kenneth Griffin paid $238 million for a weekend crash pad off Central Park South in a building that replaced apartments full of rent-stabilized tenants. “If you have a $5 mllion condo or co-op and it’s your permanent residence, [the tax] doesn’t affect you,” Glick said, going on to list people like celebrities, athletes and real estate moguls who she said “dislocated” the city’s luxury real estate market with speculation and investment-property second homes. 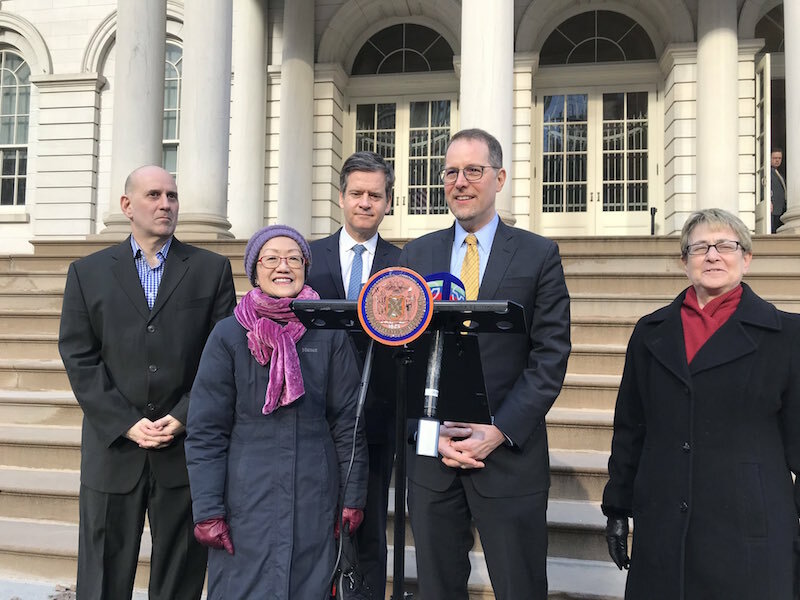 The tax, per Levine, is a way for the city to get value back from people who go as far as “managing their schedule to make sure they’re only in the apartment 182 days or less” in order to avoid paying New York City income tax (something tax experts say they have to be very careful about), as they still get the benefit of city services like fire, police and sanitation. In 2017, nearly 75,000 units were unavailable for rental or sale due to “occasional, seasonal, or recreational use”– up from 55,000 in 2014, according to a city survey. Hoylman also pointedly talked about the benefits that pied-à-terre owners got from the city, without paying in to a satisfactory degree. “I like to call it an oligarch tax,” Hoylman said. “There are foreign owners currently purchasing property in New York City, not contributing to city services, not contributing to the security of their money. It’s not just our firefighters and police that make our city safer, it’s our laws. And they are benefitting from the rule of law by knowing that their dollars are kept preserved well in the United States of America and New York City in particular,” he said. The city’s political leadership also supports the bill. Mayor Bill de Blasio told Albany legislators he was in favor of the idea when he testified in front of lawmakers on the city’s budget needs in January. Comptroller Scott Stringer tweeted that the law could raise $650 million per year for the city. City Council Speaker Corey Johnson, who supported Hoylman’s bill when he was merely a humble Council Member, called for the bill’s passage after Griffin’s home purchase, and also told state lawmakers he supports the passage of the bill. 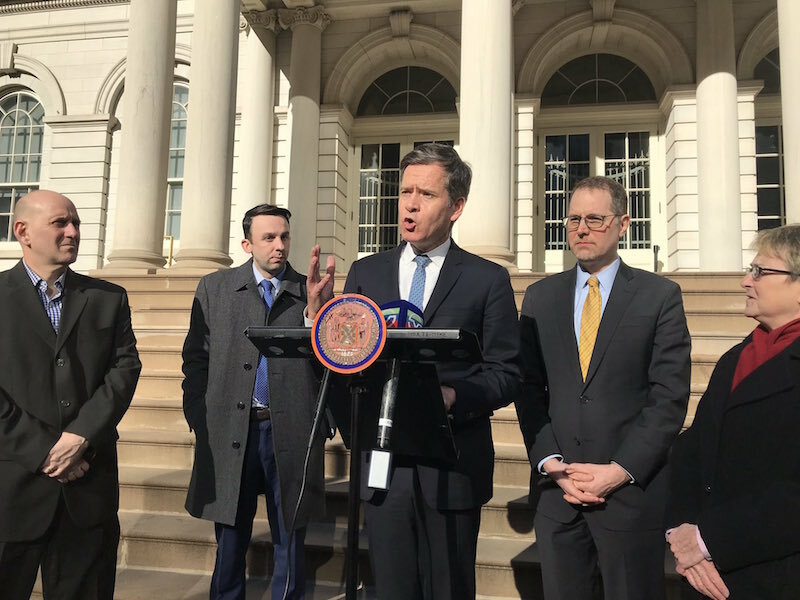 While Hoylman’s bill died in the Republican-controlled State Senate, Vancouver passed a somewhat similar tax on empty homes in the years since New York first tried to pass a pied-à-terre rax. The difference between the Vancouver law and the New York proposal, though, is the price threshold on the second homes: to avoid the tax, every property owner in Vancouver has to show their home is occupied for at least 6 months of the year by the owners or rented for at least 30 days at a time for six months. The result, according to the Times, has been a 15 percent drop in vacant properties in the city.